Prior to the existence of formal currencies, or where they were in short supply, business transactions depended on bartering common items of recognized value. But barter always presented a problem -- if you had chickens or cotton to trade, you needed to find someone who wanted what you had to offer and who valued it as highly as you did. Currency is a sophisticated form of barter. It consists of something that has an accepted value that can be traded for desired commodities. Though commonly perceived as being paper dollars or metal coins, a currency can be anything of mutually accepted value. Early native American currencies included furs and wampum. Even before the arrival of the Pilgrims at Plymouth, the Indians used "Wampumpeag", which was shortened to "Wampum". 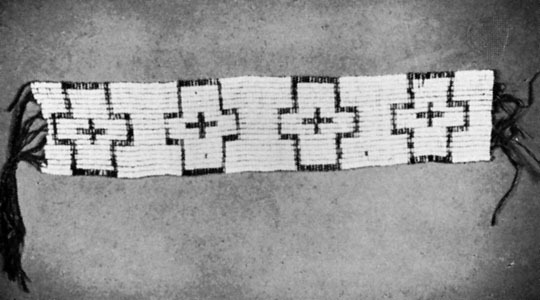 The wampum primarily served historical, political and social purposes. The designs and colors often told stories or recorded events or represented a transaction or treaty. It was constructed of polished, cylindrical beads made from different color clam shells woven into strings or belts 18 to 72 inches in length. The rarity of certain colors and the skill involved in drilling and polishing the beads and weaving them into intricate designs gave the belts their value. The early colonists bartered things necessary for survival, such as livestock, guns, musket balls, animal hides and fur pelts, iron nails, lumber, fruits and vegetables, farm implements, and tools. The primary currency they used was the Spanish milled dollar, or "piece of eight", and the Spanish doubloon (worth 16 dollars). The Spanish real (pronounced "ree-'al"), was equivalent to one-eighth of a dollar, or one bit (12.5 cents). Thus "two bits" was equal to twenty-five cents, or a quarter of a dollar, and we still use that expression today. Though the Spanish coinage may have been the most common, the English government required all exchange be based upon the British pound or shilling, and records for the period have references to both the more prevalent Spanish currency (doubloon, dollar and real) and the Imperial pound, shilling and guinea. In addition to wampum, the Commonwealth of Massachusetts also declared corn and tobacco as legal tender. These goods could be used to pay taxes and debts to the Commonwealth as well as for other items, such as college tuition and transportation costs. Wampum experienced inflation where some tribes, such as the Narragansett Indians, contrived ways to produce it in quantity (the Narragansetts were very industrious, harvesting the shell in the summer, making wampum in the winter and sending out runners hundreds of miles to trade it). By 1660 the inflation of wampum was so severe that it was no longer accepted as payment for taxes. The colonists also used what was called "Country Pay" or "Country Money". This consisted of natural commodities like tobacco, rice, indigo, wheat or maize. Tobacco became so important that it remained a form of currency in the colonies for almost 200 years. In 1652, John Hall opened a private mint and produced a variety of coins, including his "pine-tree" shillings. This mint was forced to close in 1684. Currency remained in short supply throughout this period and barter continued to be the most common medium of exchange. The Massachusetts Bay Colony printed paper money, or "bills of credit", as early as 1690 to pay soldiers returning from an expedition to Quebec. Other early provincial governments experimented with printing money to pay military conscripts or for construction of public projects. These colonial currencies were sometimes very crude, lacking the sophisticated engraving and printing equipment available in Europe. Some printers, such as Benjamin Franklin and Paul Revere, devised special papers containing mica to give them strength. The mica also gave the bills a natural sparkle which made them very unique. Many of the bills of that era had written on them "Tis Death to Counterfeit", but none of them survived very long. In the early 18th century, some banks issued paper money secured by mortgages against borrowers' properties. One example is the Pennsylvania Land Bank which issued notes between 1723 and 1729. It received the support of Benjamin Franklin who in 1729 published his Modest Enquiry into the Nature and Necessity of a Paper Currency. He subsequently received the contract for printing the bank's third issue of notes. Another early form of paper money was "tobacco certificates" which were tied to the quantity and quality of tobacco on deposit in public warehouses. It was easier to carry a certificate than the tobacco, and they were authorized as legal tender in Virginia in 1727 and continued to be accepted throughout most of the eighteenth century. During this period, the value of wampum declined rapidly as the colonists devised tools and manufacturing plants to mass produce it. In 1760, J.W. Campbell built a factory for manufacturing wampum in New Jersey which remained in production for a hundred years. In 1811, J.J. Astor expanded the fur trade to the far West and Pacific Northwest. A large percentage of that trade was based on beads, including wampum from the Campbell factory. The fiercely independent colonies probably contributed to their own financial woes by refusing to adopt comprehensive regulations for printing money. Massachusetts and Rhode Island, for example, contributed to inflation by printing excessive quantities of paper money. The ensuing confusion led to the collapse of financial institutions, the loss of personal fortunes and a widespread distrust of the local currencies. As a result of the chaotic financial situations in the colonies, the British government began to increase its restrictions on the rights of the colonists to issue paper money. Finally, in 1764, the issuance of any paper money, except for military purposes, was banned. Two years later, in 1766, Benjamin Franklin pleaded with Parliament to allow a general issue of colonial paper money. They refused and that refusal was one of the issues which fueled the Revolutionary War. In 1775, the Continental Congress issued paper money to pay for the cost of the American Revolution. It almost immediately became worthless due to a lack of confidence in the war. Over-printing and counterfeiting also damaged the value of this early paper currency, and its value plummeted to about one thousandth its stated value. The phrase "not worth a Continental" refers to the worthlessness of these paper bills, but the Revolution would not have been successful without it. It was over half a century before another attempt was made by the colonists to have their own currency. The end of the Revolution ushered in another period of financial chaos and, in 1792, the government established the dollar, based on 100 cents, as the national currency in preference to the British pound and shilling. In 1794, a mint was built by the federal government in Philadelphia, but its production was limited by a shortage of gold and silver bullion. As a result, in 1797 legal tender status was restored to Spanish dollars. (Joseph Cloud was "Refiner and Melter" of the United States Mint at Philadelphia from 1797 until 1836. He was appointed to this post by General Washington.) See CFJ Vol. III 1980-81 No. 4, p. 1; Vol VII, No. 1, p. 17; Vol. XIV, No. 4, p. 91. Following the revolution, there was great opposition to banks and, by the beginning of the War of 1812, there once again existed no government bank to exert a restraining hand on the commercial banks which issued too many notes backed by too little specie and the financial scene reverted again to its inflationary pattern. Congress again authorized private banks to issue paper currency in 1836, and well over a thousand began printing currency. Since they were privately owned, the value of the money was based solely on the reputation of the institution printing it. Distrust in the printed money was common place. There was also no central regulation for the design or value of the printed notes, and at least 30,000 different bills are known to have circulated during this period. The ensuing confusion often resulted in a bank's currency being unknown or not accepted in other areas, and most of the notes quickly became worthless. By 1860, the government began imposing a surcharge on these privately printed notes, eventually forcing all of them out of circulation. As a result of the financial demands of the Civil War, the first official United States paper currency was approved by the U.S. Congress on July 17, 1861. The first printed notes were Demand Notes, supposedly redeemable in gold or silver coin, though it was in very short supply due to hoarding. Printed on both sides in green, they became known as "greenbacks", a term still in use. One year later, Legal Tender Notes appeared. These were enforced by federal law as legal tender, which required their acceptance as payment for "all debts, public and private except duties on imports and interest on the public debt". The government then reduced the number of greenbacks available, which unfortunately had the undesired consequence of strengthening a dismal period now known as the "Long Depression", spanning approximately 1873 until 1897. This financial crisis spawned the formation of a Greenback political party in 1875 which campaigned for an increase of notes in circulation. After the upheaval of the congressional election of 1878, it was agreed to fix the number of Greenbacks in circulation at the then current amount. The federal government had begun backing some of its paper currency with gold at the end of the Civil War in 1865. The Gold Certificates raised confidence in the paper money and they remained in circulation until the Gold Reserve Act issued by President Franklin D. Roosevelt in 1933. The Federal Reserve appeared to have failed miserably after Black Thursday of October 24, 1929, which saw the beginning of the Great Depression, and a reaction to it was inevitable. The subsequent Gold Reserve Act is the only time in our history our government has confiscated money from its citizens. It required all Gold Certificates be exchanged for other types of paper currency. From our country's earliest periods up until 1963, the various objects of exchange, whether wampum, barter or minted currency, had extrinsic, recognized value. Only in recent years has the nation's people and its economy placed such importance on paper money. As the nation and its economy matured, the government continued to increase its control over the nation's currency and, in 1913, the Federal Reserve System was established as the central bank of the United States. Fifty years later, in 1963, the people had become so accustomed to using paper money that there was little protest as all promises of redemption were removed from paper currency. In that short 50 year period, money went from having a stated redemption value to being backed solely by the government. Breen, Walter. Complete Encyclopedia of U.S. and Colonial Coins. New York, NY: Doubleday Publishing, 1987. Doty, Richard. America's Money, America's Story. Sydney, OH: Amos Press, Inc., 1998. Glyn. A History of Money from Ancient Times to the Present Day. rev. ed. Cardiff: University of Wales Press, 1994. Johnson, Emery R. Geographic Influences Affecting the Early Development of American Commerce. Bulletin of the American Geographical Society 40 (1908): 129-43. Cloud Family Association Journal Vol. III 1980-81 No. 4, p. 1; Vol VII, No. 1, p. 17; Vol. XIV, No. 4, p. 91.